So what was the ideological basis of the new one of the two major parties of the interwar - the Labour party? In examining the political ideology of the two parties that dominated Inter-War Britian we will first examine Labour for the simple reason that it was an entirely new party while the Conservatives were not –and their ideology consequently followed it's pre world war 1 contours much more closely. IT should be emphasised that these viewpoints were not necessarily held by every member of the party held dogmatically and was muted by electoral consideration and by a belief n “gradualism” common to virtually all democratic parties at virtually any time-for the Labour party was firmly committed to liberal democracy more so than virtually any continental Socialist party of the era. It’s also important to realize the extent of these differences. In particular continental socialist parties were nearly all Marxist or very heavily Marxist influenced even when passionately anti Soviet. There was a Marxist influence in the Labour party-perhaps most notably through Sir Strafford Cripps the “messiah” of the Labour left in the 1930’s but it was limited. Indeed even Cripps’s Marxism had distinct limits-he was a devout even preachy evangelical Christian (when succeeded as an mp by Tony Benn he praised him as “as true a Christian”) unthinkable even among moderates in most Continental Socialist parties of this era. British Socialism or "Labour party ideology’s of this era can’t be boiled down to a single set of texts even to the limited extent one can for continental socials parties. However t had a number of quite coherent ideological themes on both domestic and foreign policy. Domestically one major theme was a belief in economic redistribution-in the redistribution of economic income and wealth to create social equality-generally through progressive taxation and different forms of Social services. IT’s worth noting the most vicious split in the Labour party in this period was in 1931 when a Labour cabinet narrowly refused to go along with nominal cuts in unemployment benefit (it may have stayed static in real terms-it was a time of deflation) which were accepted by even the most “paternalist” Tories and nearly all “radical” liberals. Contrary to myth a majority of the Labour party have never believed in absolute economic equality-but a move towards it was an overwhelmingly consensus from this period onwards. Another pillar was an attempt to end conflict in industry through collective (legally speaking government) ownership of major parts of the productive economy. This was argued for on grounds of efficiency –it would eliminate what was seen as wasteful in profit and competition. But even more important was a powerful ethical and sociological idea- that collective ownershi8p could end or at least massively mitigate the conflicts and perceived materialism of the capitalist system and bring a new era of co-operation. The notion of a new “Jerusalem” in Labour thought owed a great deal to this idea of replacing conflict with cooperation-and state ownership of much of the productive part of the economy. The lack of a Labour majority in this era meant very few steps were made towards this but the intention was there. The same motives lay behind planning- the attempt to control the workings of the production and the capitalist economy through planning- price controls, production controls and the like again replacing the waste. Nearly all the liberals who joined the Labour party were those who had expressed sympathy for such planning before World War I. As mentioned in a previous post planning had often be embraced by was often those liberals who were "imperialists” before the war. One of these was Lord Haldane before World War I often regarded as virtually a Tory-who became a Labour Chancellor in the 1920’s. Another effective principle of the Labour party’s ideology sat a bit an uneasily ideologically with the others- that was defence of the legal immunities and independence of the trade unions. In part through historic accident the British trade union was immune to most forms of legal restrictions (for example they could not be sued for going on strike in breach of an agreement) and were essentially completely autonomous- a combination found virtually nowhere else in the world. The Labour party had been founded in the 1900’s to protect and restore these privileges-with great success. It was not so successful in the interwar period-there were moderate restrictions on the unions imposed by the Tories in the wake of the Great Strike and the high unemployment of the era made it a difficult one for union membership. Defending almost completely autonomous bargaining unit’s sits somewhat uneasily with the attempt to tame competition and conflict. One clash was triggered by the creation of London Transport (in some ways the greatest Socialist achievement of the interwar eras) by Herbert Morrison then minister for transport. 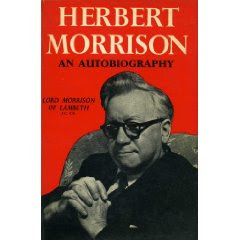 He clashed sharply with Ernest Bevin the greatest trade union of the era over the terms of its creation –Bevin representing trade unions sought to have guaranteed union representation on the board which Morrison serving a vision of planning for a perceived common good refused-this triggered a lifelong hatred by Bevin for Morrison. However politically at least this was type of clash was the exception not the rule. For example the union leadership were opposed to unemployment benefit cuts and Trade unions (particularly the miners) were increasingly keen to Nationalize major sections of the economy to gain a more sympathetic employer. And as we shall see trade unionists were the electoral base of the Labour party. The Labour party ideology on foreign policy was again based on replacing conflict with cooperation. In this case it took the form of a big belief in cooperative international endeavours which made a plausible case to be based on some kind of “collective” interest and particularly the League of Nations. It also led to an intense wariness of war and assertive nationalism. This meant that the Labour party was consistently more supportive than the Conservatives of compromise with l movements for auto money and independence against the United Kingdom (in the inter-war period India and Ireland were by far the most politically significant) and consistently more hostile to arms spending (in the early 1930’s the Labour party came very close to supporting total disarmament). For much of the period Labour party foreign policy was dominated by the imperatives of disarmament and opposing to “warmongering”. Naturally the events of the late 1930’s brought a change-but there was still a distinctive element to Labour party foreign policy which was more supportive of a grand rather than tight alliance (for example one that included the Soviet Union) and more respectful to the League of Nations. IN a sense it was not only a belief in cooperation that tied together Labour party ideology on domestic and foreign affairs but a belief in equality-in this case the equality of states and national movements among themselves. Unsurprisingly given how close the Labour party had been to the liberals there was a lot of carry over ideologically – even though opposition to “privilege” as opposed to a belief in equality and cooperation was not central to Labour thought. This was reflected for example in a general support for free trade strange in a party of state planning of private enterprise. This was partly a historic legacy. It does perhaps also reflect the reasonable view of tariffs as a tax on the poor and the belief in international cooperation. They also inherited the liberal party’s wariness to the “non parliamentary” aspects of the Constitution settlement- particularly the House of Lords. However constitutional issues were much less central to the labour party which failed to manifest the enthusiasm for constitutional reform that had been a feature of liberals. This is particularly noteworthy given that these institutions (with the important exception of the Church of England) were more hostile to “Socialism” and the Labour party than they had been to “radicalism” and the liberals. It should be emphasised such a description is general not specific. The Labour party even at an elite level was a broad enough church- after all several of its leading members broke with the Tories Even igniting that there were other examples of exceptions- for example that the rabidly teutonophobic Hugh Dalton had little time for disbarment much less pacifism. It should also be noted the huge areas that the ideological preoccupations of the Labour party left uncovered. For example a belief in planning and government ownership did not mean that one rejected balanced budgets or believed in “reflationary” (unorthodox “in a specific sense) economics-0 and indeed despite the best efforts of an Oswald Mosley (briefly a McDonald protégé) the liberal party proved much more sympathetic to such policies in this era. To take another example while the extension of social services was championed selective education or traditional gender roles were generally embraced not rejected- they simply did not clash with the core principles of Britihs Socialism and indeed they arguably fitted in unusally well with those of the Labour movement. Thus while in many respects the Labour party of the inter-war period was more radical in principle than it has been for nearly all its history since in other respects it was a lot more “rightwing. "The ideological development of the Labour party has not been a simple story of moving “right” or “left” but a much more complicated one. This is a picture of Herbert Morrison-one of the titans of the Labour party of the Inter-war era. In terms of Labour ideology in the 20s and 30s, then I do think there is a key difference between the long-term aims - as laid out in Clause IV - and the short-term aims. In the long-term, even the right of the party paid lip-service to the idea of large extensions of public ownership in those days - although the lack of a majority and short duration of Labour governments meant this was not legislatively proposed until 1945-51. In the short-term, though, the aim was the amelioration of the condition of the working-class. It is for this reason the union-party link was strong. This did mean more egalitarian tax policies and [to a degree] extra public spending. The thing is, this was before the age of Keynes and so [in theory] you had people [like Snowdon] who were in theory committed to nationalisation but at the same time opposed deficit spending. I suppose they would have said that Lloyd George, in 1929, when he put forward quasi-Keynesian ideas was trying to save capitalism from itself by deficit spending whereas they were aiming - in the long-run - to supplant it. The free trade issue is interesting and, to a degree, it may reflect the fact that many Labour figures were ex-Liberals. It might also have been concern about the regressive effect of tariffs, as you say. Additionally, of course, the 1923 hung parliament only came about because Baldwin called an election on protection. His loss was therefore seen as a defeat for protection and so Labour would follow a free trade line in 1924 and 1929-31 [of course, they would not have been able to do anything else as a minority government even if they had wanted to, since the Liberals would have brought them down if they tried to bring in protectionist measures]. James i realize your driking but while think there was very real Marxist influence it was a lot less so than most other self defined Socialist parties -and that this is important. Cripps is a very good illustration of this. Vilno great comments- say what I was trying to say much better and good point on idea of "working class" (though that if identified with organised Labour assumes a somewhat marxist model of class struggle I'm not sure Morrision would have subscribed to). Not sure though that it was a "long term" vs "short term" aims it was about what was possible-i think the effort to promoate common ownership was at least as serious as efforts to increase Welfare expenditure -and the record of Labour in the immediate Post war suggests it may have been more-they natinalised quicker and more extensively than they expanded the welfare state. i agree with the "pre keyneisan" comment though there was reflationists-they were just quite margianl to the Labour party. joking not drinking james sorry for the misspelling! No, drinking was right, Sulla. The interwar era and the "old politics"